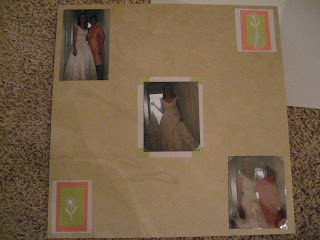 i have recently started wroking on my wedding scrapbook. 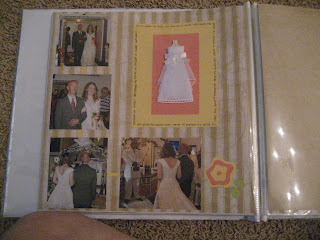 here are a few of the pages i have finished in the book!!! 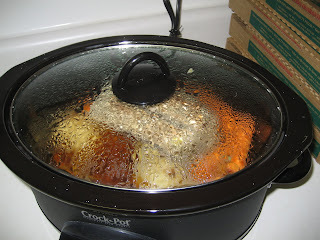 so this sunday i got up extra early to make a POT ROAST! unfortunately i chose the wrong meat and therefore it was extra crispy dry! but trial and error is what makes the food better. 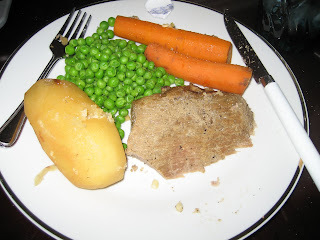 The great thing was my potatos and carrots were awesome and that is what i ate the most! This week has been quite eventful in the fact i have 31 days until the wedding. We have our new apartment- Rod will be moving in on June 1st and I on the 7th after we get married. I am excited! Once we get in there and situated i will take pictures so everyone can see. I am currently waiting on a phone call from the Dr.'s office that i applied for. Work has been okay here at Primerica but it is not the ideal job. It would be nice to work in this area because it will be close to our apartment. I will be living 20 min from Luke and Erins in Snellville so i can still see the girls and Andrew. And i am 20 min closer to David and Eva- it will stil take me 1 1/2 hours to get there but still 20 min closer!!! I am excited that i get to decorate our apartment!! I know in the bathroom the colors will be Brown and a soft sea blue! its very pretty! In the bedroom i am going to also use brown, blue, purple, green, tan and coral. I thought those colors would go well with the Brown comforter- those colors are only the sheets! I am not sure if i will put curtains up- it would be nice but that might be a later added touch! Eva recently gave me Farmors Blue and White dishes- i thought instead of using them ( in case they break due to old age) I would get some wall mounts and place them up in the kitchen or in our dining room! Just to have a couple memories on the walls. I remember the blue and white bowls- Farmor would hand us these bowls to eat cereal in but they were to shallow and had a very wide lip to them. when you were done eating and tried to drink the milk it spilled all over. I used to get so mad but now i chuckle because i probably looked so stupid trying it over and over again, even though i knew it would spill! That is one thing i miss, being in Florida. Not that i dont like it here in GA but it was so beautiful in Florida. I remember the first day i came to live in FL. It was rainy and the water was breaking on courtney campbell causeway. I met all the people that worked at the corp and went to our new home. Florida has held a lot of memories for me and my family. My farmor and Farfar lived in Florida, Mom and Dad had lived in Florida and that is where Erin and Eva were born. Florida was our vacation spot for the majority of our lives. If there was anywhere in the world that was stable to us it was Florida. It seemed as though we were always brought back together in Florida. Now it will be Georgia. 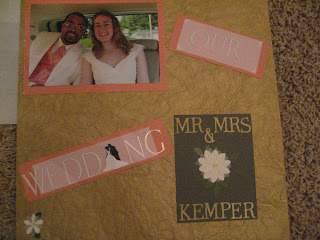 Mom and Dad are in Kenya and when they come it will be in Georgia. It is always nice to know that there might not be a stable home structure but there will always be something stable in your life. Now we know that when we have gatherings it will be in Georgia or in South Carolina. Florida we will miss you but Georgia here we come!!! The nice thing that Rod and I share is that his family lives in Georgia and for 1/3 of my family lives in Georgia. 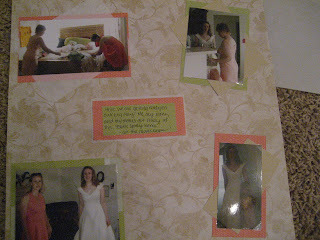 It is nice to know that we always have love surrounding us and even if we werent in Georgia we would have it in South Carolina too!!! well it is almost quitting time and my rear hurts from sitting so i am going to hop out of my seat and try to pass the time along! love to all the dear ones! Well i am at work waiting for problems to be solved! Our company made a boo boo with orders- now i have to wait. I don't mind so much because i have not been able to get on here and write. This past week i have had the awesome experience to go to church and here Pastor Wright speak about the blood of Jesus. Here are a few notes! 22)And almost all things are by the law purged with blood; and without shedding of blood is no remission. Pastor asked us " How important is the blood of Christ?" In the O.T. an animal was to be sacrificed for the sins of the people. God sent his son to be our atonement. In the old testament the animal was sacrificed to save the people from their sins- but it did not take away sin. I know that Jesus came to save us, but my understanding is so much deeper. To know that God was tired of people sinning and the sacrifices would not save them, that he would send down his own son to delete all sin forever is astonishing! Blood had to be shed as a sacrifice once and for all and that was Jesus Christ. The Blood of Christ not only was shed to save the world but also to cleanse. 7But if we walk in the light, as he is in the light, we have fellowship one with another, and the blood of Jesus Christ his Son cleanseth us from all sin. -Blood keeps our body healthy and alive. When we rebuke the word of God, Jesus or even the man of God, we cause great sickness in our spiritual body. Leukemia- when white blood cells multiply too rapidly. This causes our bodies to get sick. when we rebel against God's word we are sinning.